Today we concluded (sort of) our apartment hunt in Westchester. While we haven't really nailed down a place to live we have found several places with pluses and minuses that we must now talk to death until we finally grit our teeth, pick a place, and hope for the best. On our way home we stopped by the farm share pickup and picked up this week's share: Corn, lettuce, dill, red onion, yellow onion, yellow wax beans, potatoes, beets, kale, red komatsuma, eggplant, Cortland apples, and Gala apples. Instead of discussing things right away I went into the kitchen and started cooking with no real goal in mind. We didn't really have any groceries or anything other than then things we've gotten from the farm so it was clearly going to be a vegetarian meal. 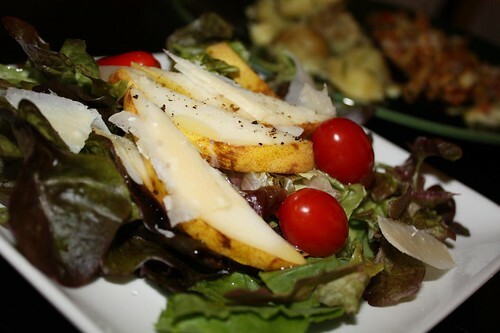 I started by making this pear and Reggiano salad with lettuce and pears from the farm and a few grape tomatoes. 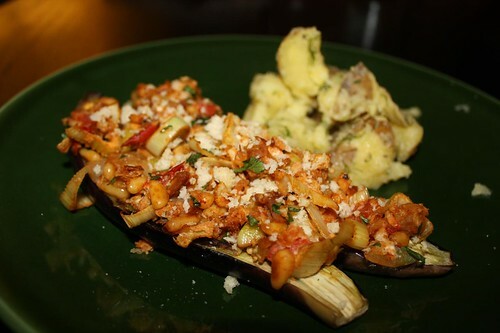 For the main course I hollowed out the eggplant, and stuffed it with a mixture of garlic, onion, the hollowed out eggplant bits, fennel, tomato, parsley, pine nuts, balsamic vinegar, and chevre. 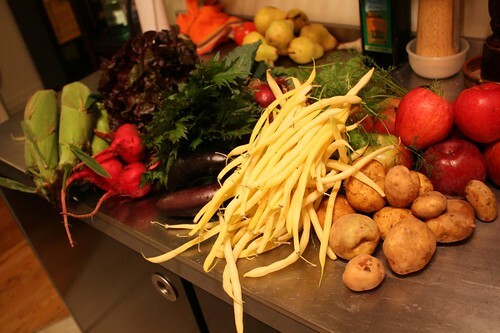 Most of the obvious items were from the farm share. The other items were odds and ends that we need to clean out of the fridge and pantry before we move. 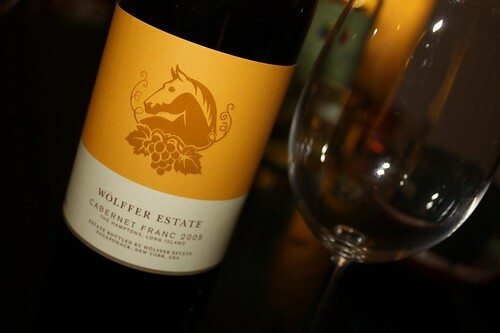 To help lighten the load we will eventually have to move we opened this bottle of Wölffer Estate Cabernet Franc. After buying some time with that brief culinary venture, which turned out to be quite tasty, we are now faced with the reality of having to choose between at least four really great apartments. This involves the making of a matrix and weighing numerous pros and cons. I think we'd pay our first month's rent just to have someone make this decision for us. Any takers?